Melt the butter in a pan, add the sugar, honey and salt and bring to the boil. Remove from the heat and add the vanilla and bicarbonate of soda, make sure stirred in well. 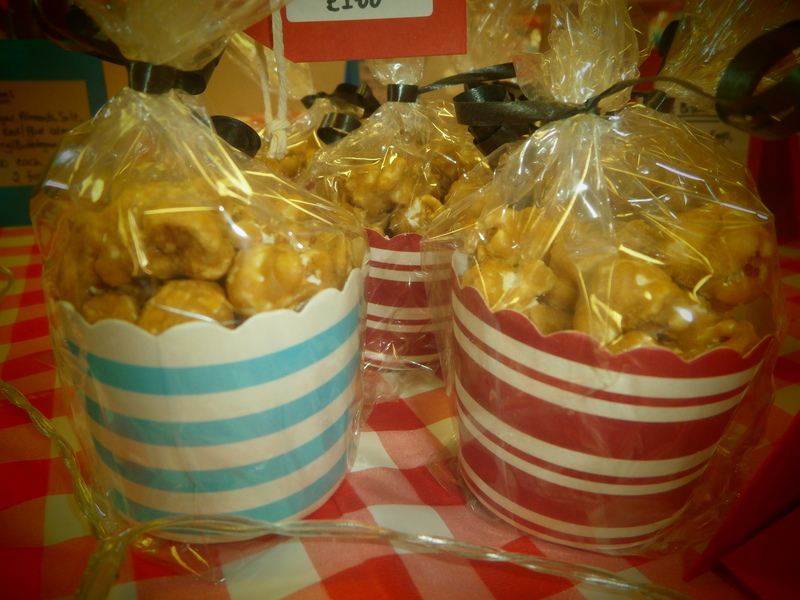 Coat the popcorn and spread out onto baking trays. This needs to go in the oven at approx. 95 degrees Celsius for 1hour. Make sure to disturb the popcorn every 20minutes to keep it from sticking to the tray and each other. Needed: One fresh pineapple, food colouring. 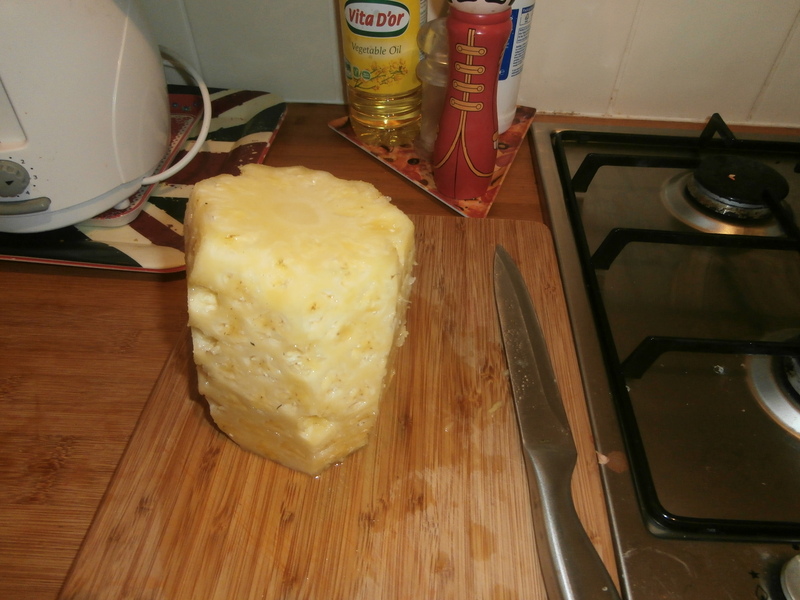 I removed the outside of the pineapple and thinly sliced (well, I very unevenly attempted to slice the pineapple thinly..!) 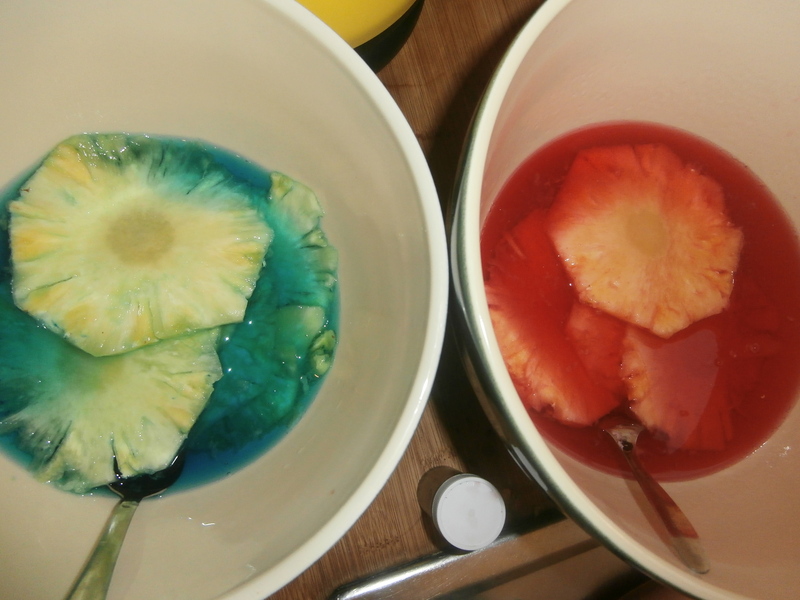 the pineapple, then split these between three bowls of food colouring mixed with water (I used pink, blue and purple- not necessarily a wise choice!). 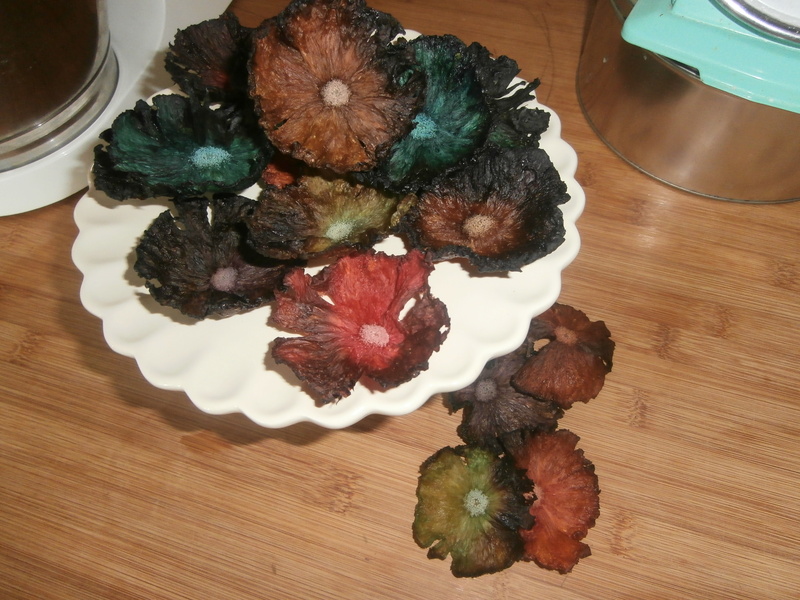 After 30 minutes I placed some of these on a lined baking tray in the oven at approx. 120 degrees, turning every 20-30 minutes. They took quite a long time to dry out but the effect is worth it. (I’m not sure the taste is though, but if you like that sort of thing then that’s a bonus!) 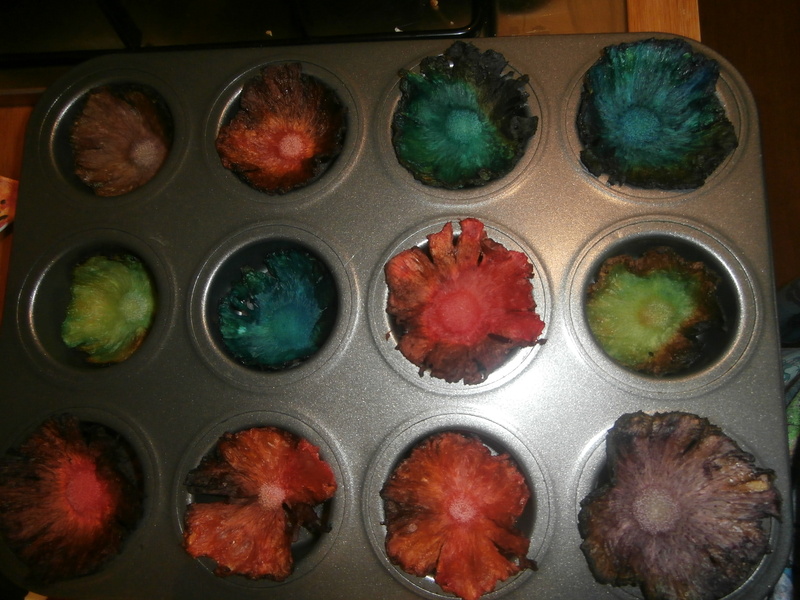 Once they were finished in the oven I placed them in a muffin tin to give them a bit of shape as they were setting. The other slices were left to soak up the colour for another 30 minutes before going in the oven. Needed: 1 large mango, 1 lemon, 1 orange, 4 egg yolks, approx. 120g butter, 80g caster sugar and 40g soft light brown sugar. I blitzed the mango pulp and added the juices from the lemon and orange to add a bit of zing. This along with the sugar, butter and egg yolks went into a heatproof bowl on top of a simmering pan of water. I whisked this with an electric whisk every few minutes until it thickened up enough to coat the back of a spoon. I need to invest in some sort of splatter guard- the mess was unbelievable! As usual, I creamed the butter and sugar together, added the zest and eggs, gradually added the dry ingredients and then folded in the yoghurt and curd. I used my loose-bottomed mini sponge cake tray (which makes 12 mini sponges, my mixture was enough for 15 which was slightly annoying!) greased and floured, and baked at about 180 degrees for approx. 20 minutes (till they’d turned golden and sprung back up to touch). Needed: Equal parts butter, icing sugar, flavoured icing sugar all creamed together. Once everything had cooled down, I sliced the mini sponges in half, sandwiched them back together with the mango curd and topped with a thin layer of the mango curd. 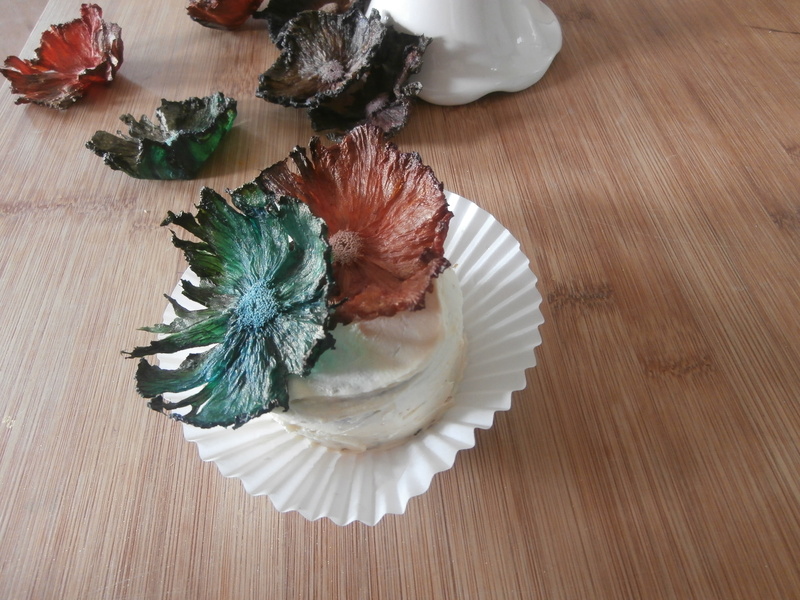 I then covered these in the pineapple buttercream and topped with the pineapple flowers!